Sometimes it pays off to study old Disney publications as feverently as I do (mostly it just means I notice that the paving patterns in the park are different), as I sometimes get answers to nagging questions I've had with little to no legwork (research). 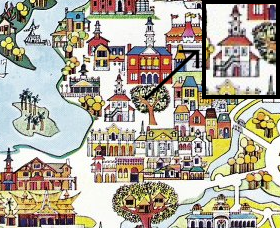 The other day I was pouring over my '73 edition of The Story of Walt Disney World - the big book shaped like a big silly capital D - and stopped over a rather famous but still noteworthy image of The Magic Kingdom circa 1969 or so. The image is famous because there in the corner of the image is the model for Davis' Western River Expedition complex, but it offers a bounty of other insights to anyone with enough paitence to squint at 70's dot-matrix printed photographs. First of all, let's assume here that for the purposes of this photograph the WED staff bothered to get this model in as orderly a shape as possible , ie, Marty Sklar's hilarious joke of the previous night where he put the Swiss Family Treehouse in Tomorrowland has been corrected. Let's assume that the buildings which have been completed are placed in their proper spots. What do we see? Well, for one, the gun stockade which divides Liberty Square from Frontierland is placed on the opposite side of the street from where it was finally built. This makes perfect sense if this is what was intended, as it would make much more concrete the rather diaphanous transition point from the American east to the American west, as well as create a stronger sense of entering the West via a stockade, an original Disneyland element which Walt Disney World is poorer without. We can also see what could be intended to be the liberty tree in front of the Riverboat landing, which frankly makes a much more logical boundary / visual climax to Liberty Square than the steam boat is now. But that isn't really the purpose of this post, rather, what's directly behind it: a building that was never built. Take a close look at the photo above and, for further proof, I offer this WDW resort map which once hung in every hotel room on property. It offers other unbuilt locations like the Asian and Persian resorts, and this strange little building right at the point where Liberty Square bends southwardly, spiritually and literally. When Walt Disney World opened in 1971, this little building had gone the way of the dodo, and where it would have stood was a sedate little seating area. Why the building was removed or what it was supposed to be will never, I suspect, actually be resolved. It could have been a shop or snack stand, and it's worth noting that the Utilidor would've run right underneath it, making either a possibility. But the important thing is that such a structure would've made the central area of the land - the square of the title - feel more like a square and less like an open street, which is more like it really is now. Furthermore, with the original Liberty Square green between the Columbia Harbour House and the side of the Hall of Presidents in place, the original designers probably saw no need for more open space at this bend of the river. I suspect the reasons were because the building was too costly, would have been redundant in an area already rich in shops and eateries (wouldn't that be a relieving viewpoint in today's company? ), or was simply removed for logistical reasons of traffic flow and such. the lack of a building here." In 1989 Disney installed a replica of the original liberty bell in the little seating area, and later refurbished the Liberty Square bridge and moved its' court of flags of the thirteen colonies here as well, so at least now the area appears to serve a concrete purpose, even if the flags do disrupt sightlines. Still, what we can see is that the construction of a building on this spot would have benefited the look and feel of Disney's colonial America in ways we can only imagine today. What would have been inside it will probably remain a mystery. 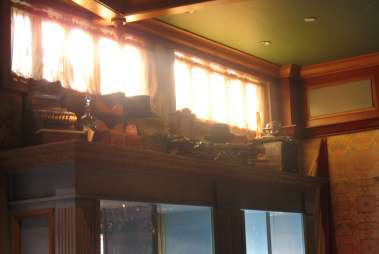 Be sure to click on the "Park Mysteries" label for more Magic Kingdom oddities, including some "Park Solutions"! OK, so I know I haven't really made my name on updating you on various things that have been happening at Walt Disney World or Disneyland, and by and large I see no need to start offering this feature regularly given there are plenty of sources for this kind of content. You can even get updates on non-aesthetic repair work Disney is doing around the resort thanks to permits filed with Orange County these days, so why bother at all? Well, even with all this onslaught of information available online I still find a lot of stuff is remaining unreported, and so now I offer you... some news. The biggest bit of news is that Muff Potter's windmill on Tom Sawyer Island is once again turning. In 2004 this little structure was struck by lightning during one of them there hurricanes and one of the windmill's arms was destroyed. The new blades appear to be made of a lighter weight material and they look quite nice, although not as nice as the old wooden timber ones. This has been something of a bone of contention among a lot of groups within the park for some time, and it's frankly remarkable that it got fixed at all given the time it took to get work done on it. Tom Sawyer Island, mercifully spared the forward march of "progress" the Disneyland original has been subjected to with the exception of a non-burning cabin and that original rock playground having been replaced with a salvage themed clubhouse, is a little pocket of old fashioned Disney fun before kids were expected to be cynical LCD-screen toting walking advertisements. So a few months ago the Market House on Main Street was deemed an imminent demise, and within a short time walls went up, work began on the inside, and outside was me loudly announcing to nobody in particular "I don't mind as long as the party line telephone stays!". When the store reopened there was no telephone, and in the stead of what was once a cozy interior was a garish and plain crystal shop. I was not pleased. Well my verdict on the shop turned out to be in too much haste for within a few months the shop was actually finished and what looked and felt like a construction zone turned out to actually be one! The final Crystal Arts shop is honestly the most beautifully realized one on Main Street, with a glass blowing furnace at the back and a dim, quiet atmosphere that reminds me of my memories of the Magic Shop's dim, haunted atmosphere. Taken as a group, the removal of the crystal shop from the seating area of the Bakery and the expansion of a Crystal shop into the poorly-used Market House qualifies as some of the best improvements to Main Street ever. I say this because these upgrades and renovations to stores and eateries is an important but thankless job which gets no accolades online, so next time you visit be sure to catch the glassworks demonstrations in the back and enjoy the beautiful interior. But when it reopened there was still no party phone. 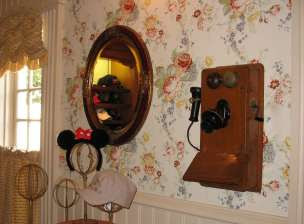 So imagine my shock when the party phone arrived in working order... at the newly refurbished hat shop, of all places. This really is a triumph for people who care about the little things in the park, traditional little things you can do, which Disneyland has a wealth of and which The Magic Kingdom has always been poorer without. Somebody at WDI really cares, is what this phone tells me, and I think my instinct here is true. Next, we switch areas briefly to comment on goings on over at Downtown Disney. It was discussed online that the Disney Village Marketplace location of Wolfgang Puck was undergoing some changes, and it was reported that it reopened with a much expanded seating area, but what nobody seems to be reporting is the beauty of the final product. Having long been a supporter of the Village's original aesthetic design and having been generally annoyed by its' current clutter and disharmony, stepping into Wolfgang Puck was astonishing. The look of the original Village has been faithfully adhered to, with tall interior ceiling beams and cedar shingles outside. The singled siding and muted colors are present, as well as a near perfect match of the thirty year old bricks on the new structure. The inside feels new and yet old, and not dissimilar from the interior of those Walt Disney World Village villas which once stood across the lake surrounded by fairways. When the Disney at Home shop closed in 2005 and made way for Goofy's Candy Company, I feared that even more of the original aesthetic of the Village was being covered up with garbage like giant plastic butterflies and mushrooms, but the adherence of Earl of Sandwich and now Wolfgang Puck to the look and feel of a more peaceful Marketplace has me hopeful. I don't have any good pictures of the overall effect, but take some time to look around inside what's currently Team Disney, inside Basin, and inside Earl of Sandwich (all interiors which retain the feel of their original tenants) and you won't be able to miss it. Finally, I've received notice that the mist effect in the first part of the Jungle Cruise will be repaired in the upcoming refurbishment, and let's hope this is true. There have been a lot of miscellaneous repairs made around the Magic Kingdom lately, including stuff I thought I'd never see done until the original show elements literally rotted and fell apart, like a lot of second-floor false plants (flowers on Aunt Polly's, window boxes in Fantasyland, vines in Caribbean Plaza), the moving light effect on the Haunted Mansion facade, a bunch of natives in the original Indian Village along the Rivers of America, and even replacing the spools of yarn on that really wacky tower along Adventureland's roofline above what was once the old Magic Carpet shop. Things are looking up at the Magic Kingdom, and although we still haven't fully dug ourselves out from under Eisner & Co.'s negligence, such progress must be commended!